Enjoy 8 miles of deserted Gulf front beaches surrounded by 5,000 acres of Bald Point State Park. Take advantage of Alligator Harbor's sheltered boating and fishing marina. The area is known for some of the best fishing in the state and less than an hour from the Tallahassee airport makes Alligator Point the perfect location for a relaxing vacation. 'Pair-a-Dice' This spacious, 3 bedroom, gulf front beach home overlooks the Gulf of Mexico with 90 feet of private beach and beautiful views of Alligator Bay. The home's wraparound decks along with numerous windows make it possible for one to enjoy a dramatic water view from every room. The home is furnished with antiques and nautical handcrafts throughout. It has a panoramic tiled kitchen and living room for family gatherings,tiled bedrooms and bathrooms, and a captain's spiral staircase to the loft bedroom. The kitchen, eating area, and utility room are a step up above the living room which may not be conducive to all age groups like toddlers or elderly, as well as the spiral staircase to the loft bedroom.. Special areas are the master bedroom with a sitting area, and a fabulous outside covered eating area, and an outside shower. Central air, charcoal grill, fully furnished kitchen, bedroom with a sitting area, washer/dryer, 3 TVs, cable, and much more. Swimming, fishing, shelling, sunbathing, bird watching, biking, dolphin watch, boating, great seafood restaurants and markets. (It's worth the trip, just to eat). Golf course is 40 minutes away. It is a great place to rest, read and enjoy nature but it is not a resort destination with commercial entertainment.. Alligator Point is a very secluded, residential, unspoiled sand dune. Come for the beach, the wildlife and great seafood. Panacea or Carrabelle are the nearest area for grocery shopping and dinning. The entire area specializes in seafood restaurants and markets. We live in Nashville, TN. We have been in the real estate business since the early seventies. We were one of the first to have a vacation rental on Alligator Point. We have built a loyal base of returning guests that enjoy the area as we know it from 1999 when we discovered this jewel of serenity. The dramatic views of the sea and the sounds at night are melodic. Private, no traffic, no line, fresh seafood, and adults can enjoy being cool under the house while children enjoy the sun. Two tiled full bathrooms and large outside shower. The location of the house does not have a public beach for miles. The beach is very private. Alligator Point is not a resort destination. It is a rural part of Florida. NO traffic, traffic lights no waiting in lines. 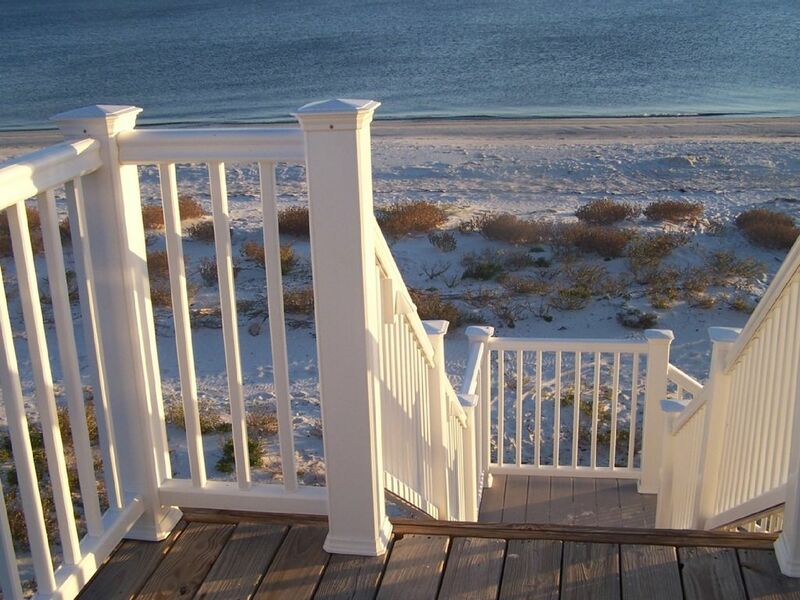 The steps and decking in the lead photo are of our home that opens up onto a sugary white beach. Central Air. We have a unit for the main house and the loft bedroom has a ductless unit that is very quite and efficient. Fully furnished We have firdge downstairs in the guests storage for drinks or fishing. Three Flat Screen TVS. The two bedrooms on the main floor and the living room. Decking around three sides of the house, and underneath the house we have an concrete area with an outside shower, toilet and picnic tables. The upstairs loft is suited best for young adults or children. There is no bathroom in the loft. The kitchen does have a step up which my not be best suited for elderly and children. If you are looking for quite, rest, and relaxation this is the place. Kathy is a great host and the house is exactly as described. Loved the long walks on the beach the sunsets and the sound of the surf. No crowds, no tattoo palors just peaceful quality time. Just returned from a week's stay at this property. Kathy, the owner, was so gracious in making sure it was ready for visitors after storm repairs from Hurricane Michael. The only major repair not finished was the back stairs to the beach, but no worries, the front steps were fine and beach access was still just a few steps away. Beach chairs, lower level picnic tables, grill, and working enclosed toilet made enjoying the outdoors even better. We've never rented a beach house (usually condos), so this was a real treat for us. Everything was there to make your home-away-from-home a great experience. The kitchen was well equipped (new oven and dishwasher), coffee maker, mixer and blender! Laundry and showers were well supplied. All you really need to bring is food, beverage, and your tooth brush. The road to this part of Alligator point does have a "one lane" section right now due to the storm washing out the shore line drive - just be cautious - but OK for any vehicle. Make sure to stock up on supplies before heading out to the property - convenience stores are at least 20 minutes away and the nearest big grocery store is at least a 40 minute drive. We were well prepared to just stay put for a week. Beach very quiet this time of year, but had some great weather for walks, runs, fishing (not catching), amazing sunrises and sunsets. Internet and cable worked great. We read, watched Netflix, enjoyed the beach, and disconnected from our busy professional lives. This is a great property - families would enjoy with upper sleeping area for 4, 2 bathrooms and bedrooms downstairs, covered lower area, and lots of upper deck space to enjoy the views. One of our favorite rentals ever! Thank you for your time in writing this review which will help others in planning their vacations which we all need. We were having an amazing time here, but unfortunately we didn't get to finish our stay. Due to Hurricane Michael we had to evacuate after only a couple of days. However, I can't say enough how much we appreciate the owner! Even though we had not purchased trip insurance, she only charged us for the time we were there, refunding the rest. We can't wait to come back during better weather. Thank you for your time in writing the review. We always have our guests safety foremost and treat others the way we would want to be treated. Anytime there is a mandatory evacuation, we want our guests to heed the advice. Hopefully there is an area they can evacuate to and enjoy the rest of there vacation but this was not possible with hurricane Michael. I look forward to their return so they can enjoy the many things this natural reserve has to offer. Loved being right on the beach and having everything we needed for a comfortable stay! We stayed for a week as a family of seven and felt very comfortable in the home. The beach was quiet and perfect for our little ones to run around. Being secluded was a nice change of pace for us! Thank you for taking your time to write a review. We appreciated hearing from you and hope you will return. Love. Love. Love. Best beach trip we have ever had. Thank you. Hope you can make it next year . If you're looking for a place to relax, this is it. You're toward the end of Alligator Point on a gorgeous stretch of beach next to a bird sanctuary. If you're a birder, go. If you like to fish, go. If you love the beach, go. The home is well appointed for cooking and there is a place to clean your catch. You have options to sit in the sun on the porch, get out of the sun by sitting below the home, or if you really want sun walk to the beach. You can't get much closer to the beach than this property. Dolphins were in the surf most mornings, some no more than 10 yards off the beach. We watched them and kayaked alongside them a few days. For all the types of travelers out there, expect more of remote beach experience. You will see *some* people, but not many as you're at the far end of a beach away from the public access points. Weekdays, we were lucky to see 10 people. There is not a lot of nightlife here and it shouldn't be expected. The forgotten coast is all about enjoying what Mother Nature has to offer (especially the peel and eat shrimp!) We will certainly be back in the future. A special note to the owner as we came back one night from a late fishing excursion (11PM) and discovered water dripping from under our porch. We shut off the water to the house for the night, made a phone call to the owner and had a plumber out the next morning. It was a minor inconvenience to the overall trip, but it showed us that the owner was respectful of our vacation time and extremely prompt. Thank You! Thank you and we look forward to having you again. It’s always rewarding to hear from our guests and that they enjoyed what the area has to offer. The Big Bend area in the Panhandle, Florida near Tallahassee.